GENASYS High Density Matrix Switch Card | Marvin Test Solutions, Inc. The GX6188 is a 6U PXI, high density matrix, GENASYS architecture switching card. The card provides the user with the ability to connect and interface resources to multiple UUT connections. The board consists of two matrices - a 104x8 and a 8x8 matrix. The GX6188 can connect to 104 UUT switching points, eight external resources and an eight channel global bus via front panel connectors. Multiple GX6188 cards can be connected using the global bus. 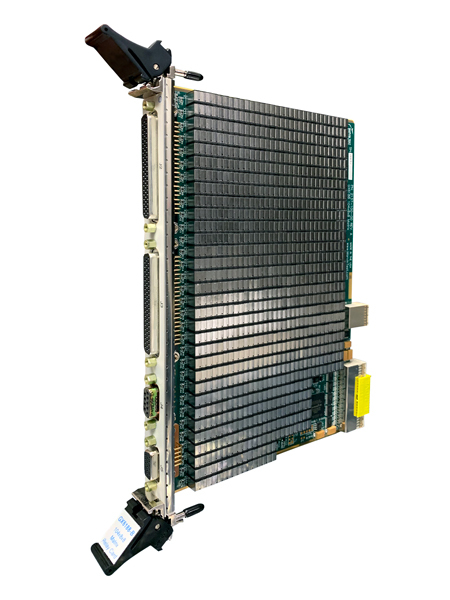 Like other GENASYS switch cards, the GX6188 features an integral, 3-dimensional switching architecture which provides the flexibility to connect test system resources to multiple UUT connections as well as supporting an expansion bus connection without sacrificing I/O matrix connections when building multiple switch card configurations. The GX6188 matrix card consists of a 104x8 matrix and a 8x8 matrix. Any of the 104 UUT connections can be routed to the eight resource connections via the internal 8-wire global bus and the 8x8 matrix. In addition, each of the eight global bus lines can be connected to a grounded bleed resistor or the built-in-test (BIT) voltage source. Multiple cards can be connected to create larger switch matrices by interconnecting to the 8-wire global bus which is available on the front panel of the switch card. There are also 14 general purpose digital I/O signals which are accessed via the card's I/O connectors and can be used for cable ID, external reset of matrix relays, or for creation of a PXI bus interrupt. The board is supplied with the GXSW library, a software package that includes a virtual instrument panel, and a Windows 32/64-bit DLL driver library and documentation. The virtual panel can be used to interactively program and control the instrument from a window that displays the instrument’s current settings and status. In addition, interface files are provided to support access to programming tools and languages such as ATEasy®, LabVIEW™, LabVIEW/Real-Time, C/C++, Microsoft Visual Basic®, Delphi, and Pascal. An online help file and PDF User's Guide provides documentation that includes instructions for installing, using and programming the board. A separate software package - GtLinux - provides support for Linux 32/64 operating systems.